Hancock Fabrics 50% Off 4 Day Sale! You are here: Home / Great Deals / Hancock Fabrics 50% Off 4 Day Sale! 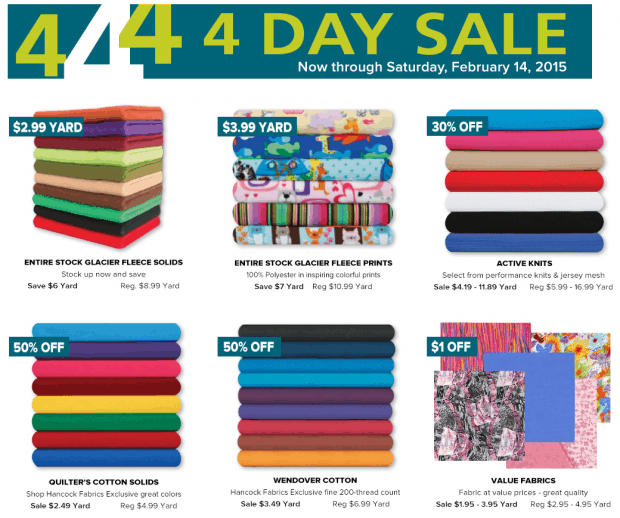 The 4 Day Sale has begun at Hancock Fabrics with savings up to 50% OFF on sewing and quilting notions and more. There are also great deals on Glacier solids and prints plus 30% OFF Hancock Fabrics’ entire stock of muslin. PLUS, the Fleece Frenzy Sale is ongoing through February 18th, so there’s still time to get your savings on licensed celebrity fleece prints, batting, foam, fiberfill and much more!